Obviously, every company culture is different and sometimes what hiring managers think and say they want is exactly the opposite of what they really mean by fit. Do you find this to be the case in your recruiting experience? If so, what's the main cause of this discrepancy? I can't even keep track of how often I get recruited for positions in business development and sales, but it’s gotten to the point where I don’t even want to respond anymore. Sure, the required skill sets are similar to mine, and I could probably be successful in them if I were to make a career move. But my entire work history is in marketing. I love marketing, and anyone who spent the time to look over my background would notice that. Strong personality does not mean hard to work with!! 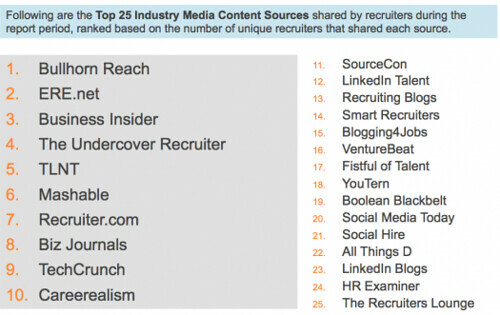 Here is our weekly feature in which we share the top articles we enjoyed from the past week about recruitment marketing, social recruiting and anything else in the recruiting space. In this article, we’ll be talking about resume alive, Google interviews, good recruiting, recruitment content and mobile recruiting. This Conference #DOESNOTSUCK - So say Amy Ala and the 250 + Others that saw some real world Technical sourcing applications from real hiring managers and real leaders in the industry. This is not yourtypical I am great therefore I teach conference. When you're applying for a new job, it's essential to research any potential employer before you apply. Why? Because it avoids wasting both your time and the employer's time and also ensures that you're in a position to answer questions intelligently in an interview situation. So how can you research your prospective next employer? Let's take a look. This was the talk I was waiting for. Mark Tortorici (@marknexus) of netPolarity just wrapped up an amazing session. Where to begin? We're off to an amazing start and I can't believe how much I've learned just in the first hour. What does the “Ban the Box” movement mean for employers? Check out iCIMS' latest blog post from iCIMS blogger Eileen Kern. I have to admit I'm in PARADISE. I have my doubts if anyone followed the past 30 days journey into an unknown future when a month ago I decided to dump what I was working on as a recruiter and start from "start". If you are a recruiting organization and looking to improve your candidate experience, I urge you to apply for the Candidate Experience Awards. This will be a great way to learn new techniques and benchmark your candidate experience against the industry’s best. This week I want to take some time to talk about one of the most important parts of the recruitment process that is often overlooked; prepping the candidate for interview. This garment factory in the Dominican Republic is paying more than three times the typical wage at similar facilities in the region. Safety and employee welfare are also a focus at Alta Gracia; workers are often seen smiling and heard singing along to the music blasting from speakers overhead. The Marriott Hotel chain is known for its large complexes and global enterprise, employing hundreds of thousands of people all over the world in hospitality positions from cleaning to management and tourism.